I have done my best to transcribe the 233 Greek names mentioned in this book accurately. If you would like to locate this book, I suggest you work with your local library, they can usually locate it through their inter-library loan program. 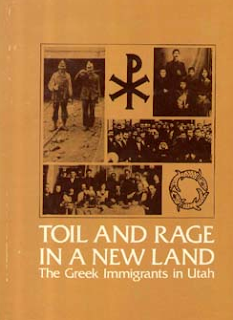 Just looking at the list of Utah Greeks. I noticed Gus Paulos on the list. Gus had a large auto dealership here and even though he has passed away his family still maintains the dealership. I just saw Chris Jouflas on this list. He was the mayor of Helper, and a neighbor of my parents.